Argentine striker who scored over 500 goals with Vecindario in Gran Canaria. 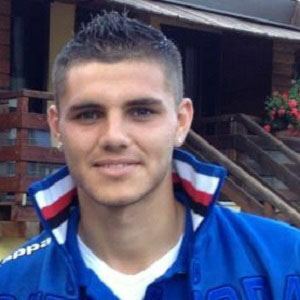 He later played for Barcelona and Sampdoria before officially joining the Argentine national team in 2013. He was born in Rosario, Argentina and moved to the Canary Islands when he was 6 years old. He was involved in a major media stir when former Sampdoria teammate Maxi Lopez refused to shake hands with him after an April 2014 Serie A match. He married Argentine model and reality star Wanda Nara, who used to be married to Maxi Lopez. He has played alongside superstar Lionel Messi on the Argentine national team.